Our series “My sqft” checks out the homes of New Yorkers across all the boroughs. Our latest interior adventure brings us to Kate Callander’s East Village apartment. Want to see your home featured here? Get in touch! 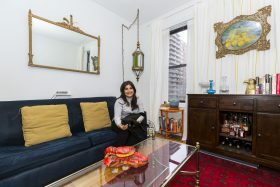 There are almost too many charming elements to note about advertising professional Kate Callander’s East Village one-bedroom. First, there are all the original features–the floorboards, claw-foot tub, penny tiles, exposed brick, and copper light fixtures. Then there’s the serene vibe you get as soon as you walk in. Hoping to create her own “slice of heaven” within the bustling neighborhood, Kate opted for neutral fabrics, whimsical touches like her beloved fairy lights, and soft, feminine finds. But most importantly, she’s filled her home with mementos from her upbringing and travels. Kate was born in Australia and raised in Malaysia and Hong Kong, but after a vacation in NYC, she decided she never wanted to leave. 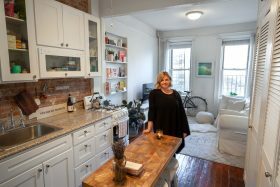 She moved to her railroad-style home four years ago and has only grown more in love with the city and her apartment. 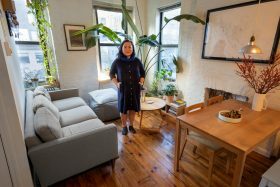 We recently paid her a visit to learn more about how she decorated the space, how New York living is different than in her past cities, and where to get the best Aussie coffee in the East Village. 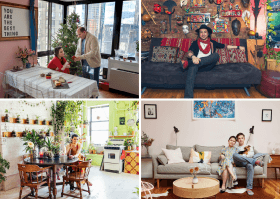 Our series “My sqft” checks out the homes of New Yorkers across all the boroughs. Our latest interior adventure brings us to artist Rob Wynne’s Soho loft. Want to see your home featured here? Get in touch! “If you have something to say, you figure out what material will help you fulfill that destiny,” said artist Rob Wynne, referencing the various mediums in which he works, from hand-embroidered paintings to sculpture to molten glass. It’s this “alchemy” that is currently being explored through his exhibit “FLOAT” at the Brooklyn Museum, a show of 16 works that “seemingly floating within the American Art galleries.” But Wynne’s talent is perhaps on display nowhere more so that his home and studio in Soho. 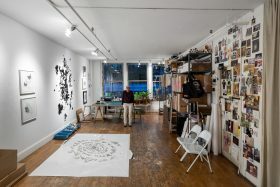 Wynne moved to the artist’s loft in the ’70s, and what has resulted is an organic and eclectic mix of decor and furniture from decades of travel, meeting fellow NYC artists, and finding inspiration through various disciplines. 6sqft recently visited Rob at his home and explored his collections of curiosities. We also got an up-close look at the process behind his large-scale mirrored glass installations, as well as many of his other incredible works. Twenty-four years ago, when writer Ed Hamilton and his wife Debbie Martin moved into the Chelsea Hotel “everybody at the hotel was in the arts. There were always parties, and somebody was always having a show of some kind.” They’ve spent more than two decades in a 220-square-foot SRO room, and despite not having a kitchen and sharing a bathroom, they have loved every second of it. Where else could you live down the hall from Thomas Wolfe’s one-time home? Or share a bathroom with Dee Dee Ramone? But eight years ago, the landmarked property was sold to a developer, and since then, it has changed hands several times. 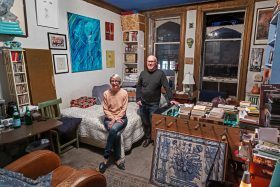 Ed and Debbie have lived through nearly a decade of “renovations” (it’s still unclear when and if the property will eventually become luxury condos), all the while watching their rent-stabilized neighbors dwindle as the construction and legal battles got to be too much. In true old-New York fashion, however, Ed and Debbie have no thoughts of giving up their Chelsea Hotel life. They recently showed us around their bohemian apartment, and even as they took us through the building, covered in dust and drop cloths, they speak fondly of their memories and their commitment to staying put. 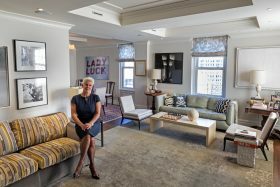 Ahead, get a closer look at why trading off space for history was the right choice for this couple and learn how they’ve made it work, what their wildest stories are from the hotel’s heyday, and what their most recent tenant lawsuit may mean. You don’t want to miss this apartment tour! Our series “My sqft” checks out the homes of New Yorkers across all the boroughs. Our latest interior adventure brings us to author William Middleton’s West Chelsea apartment. Want to see your home featured here? Get in touch! 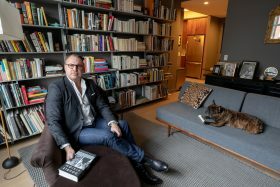 Writer William Middleton is no stranger to cities, having spent five years in NYC, 10 years in Paris, and 10 years in Houston, where he moved to work on the biography “Double Vision,” about French couple Dominique and John de Menil, who transformed the Houston art scene. But after 16 years researching and writing, William knew he wanted to move back to NYC. 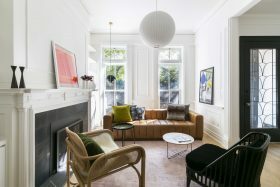 A little over a year ago, he moved into Related’s Hudson Yards-adjacent rental Abington House, where his handsome one-bedroom boasts an incredible view right onto the final spur of the High Line. Using his favorite dark gray paint color and a wall of floating bookshelves, William transformed his one-bedroom into a “clean and modern” oasis for himself and his six-year-old French Bulldog, Hubert. Ahead, take a tour of William’s home and hear about his urban experiences, why he chose this building and neighborhood, and what it’s like to have one of the best people-watching perches in all of NYC. Our ongoing series “My sqft” checks out the homes of New Yorkers across all the boroughs. Our latest interior adventure brings us to writer, artist, and event producer Emma Orlow’s Bed-Stuy apartment. Want to see your home featured here? Get in touch! 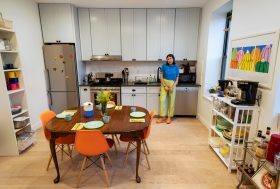 For most of us, our homes represent our personality generally, but for NYC native Emma Orlow, her Bed-Stuy apartment is a decorative translation of everything she loves and does. Part events producer, Emma has curated her space with yellow, bright orange, and lime green furniture and accessories, along with a mix of vintage mementos (her mom’s old NYC matchbook collection adorns one wall), stylish accessories (she counts among her favorite things a set of rainbow Massimo Vignelli mugs), and kitschy ’70s-era objects (see her retro Candy Land game). Emma also works as a food writer and artist working with food, another passion that can be seen throughout her home, from the JELL-O risographs to her beloved Japanese miniature food erasers. 6sqft recently paid Emma a visit and learned that you can’t help but smile when you walk into her space–or when you chat with her, for that matter. Ahead, take her apartment tour and learn what influences her creativity, where her fun decor comes from, and what simply she simply couldn’t live without.